Announcing the first ever Battleground Championship, to take place at Pandeomonium Books and Games http://pandemoniumbooks.com/ in Cambridge, Massachusetts (very near Boston, and under a minute from the Central Square subway stop). First Place: $500 cash, a small "gold" medal, and a trophy! Second Place: $200 cash and a small "silver" medal. Fourth Place: A free faction (or $30 off PW) and a dozen dice. Endurance prize: everybody who completes all rounds on Saturday gets a personalized, one-weekend-only coupon to get any Battleground faction (except Punic Wars) for $20, or $10 off Punic Wars. So basically you get your $10 entry fee back in savings if you buy a new faction. A small "gold" medal, a free faction (or one box of PW) and a dozen dice (Table dice which will have been used at that point) to the new/casual player with the best record. A small "silver" medal, a free deck (or $15 off a more expensive product, like Dark Elves or Punic Wars) and a dozen dice to the new/casual players with the 2nd best record. A small "bronze" medal and a free deck to the new/casual player with the 3rd best record. A free deck to the new/casual player with the 4th best record. There will probably be a finals match to determine best new/casual player: If one new/casual player makes it farther in the final rounds than any other, that person wins the gold--the 2nd and 3rd then play a game for the silver medal unless one made it farther than the other. If there's a 3-way tie, the two with the best records play for the gold / silver, while #3 gets the bronze. - You have never played in a Battleground tournament in which you won more games than you lost. - You check off the box on your entry form that you wish to be eligible for new/casual player prizes. I'm putting up the cash, and will be the judge (and not playing). Everyone, including people who helped design the game, is invited to play! There will be a $10 entry fee, with the money going to Pandemonium. On Saturday, April 30, sign ups start at 10:15 AM. The tournament play will start at 11:00 AM sharp and will go through Saturday evening. This will determine the final cut. The finals (Either a final 4 or a final 8, depending on how many people show up) will happen on Sunday, May 1. People who did not make the finals are still welcome to come to the store and play casual games, or watch the final games, Sunday. Players must play one faction the entire tournament, but may change the units in their armies each game. Armies must be "pure" faction only: no mercenaries. (And yes, that includes Healer Mages.) You may, however, play "Monsters and Mercenaries" as your faction. The Saturday games will vary in format: see below. In games with terrain, three pieces of terrain with be generated randomly, then each player gets to veto one of them. All games will be win-loss, so the Breaking Point and Ticking Clock scenarios will have predetermined tie breakers to ensure that there is a winner, even if the "victory point" split would be 3-3. The Saturday games are round-robin with Swiss-pairings, those who have the best records go into the final rounds. It is not single-elimination until the final rounds. Dice will be provided at the tables for all players to use. With $ on the line we don't want accusations of loaded dice flying around. All updated rules/errata will be used, as well as a small number of unofficial rules. 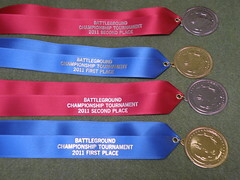 A document with all relevant rules is at http://www.swa-gaming.org/files/battleground/BFWMasterErrata-Apr30Tourney.pdf Thanks Dave! 11:00 AM - start of round 1 - 2000 points, Breaking Point, Open Map. 2:00 PM - start of round 2 - 1200 points, Breaking Point, Open (reduced) Map. Games completed and reported by 9:45. Some players who go 2-2 will play a 5th round - 1100 points, Total Warfare, Open (reduced) Map -- see below. If fewer than 8 people make it into the final 8, then the people who placed highest on Saturday (based on opponent record) receive a "bye" in the quarterfinals. Quarterfinals (assuming we have them). 2000 points, terrain, Breaking Point. Semifinals 2000 points, terrain, Ticking Clock. Finals 2000 points, terrain, Total Warfare. If attendance is high enough that more than 8 people go either 4-0 or 3-1, then a sufficient number of 3-1s with the worst opponent records do a tiebreaker 5th round (as described above) in order to thin the herd down to a final 8. Re: $500 1st prize! Battleground Championship, Cambridge, MA 4/30 & 5/1. This is extremely cool. I hope very much to play and either way I will contribute some cool prizes. I'm pretty sure the winner will affect some flavor text of a future card, if nothing else. Kevin didn't note that I will be hosting in spirit, as that is my store, though he's insisted I play. It's fine though, he's generous enough to give prizes to third so the rest of you will get something! Anyway, I'll also be throwing in some prizes, mostly focused around rewarding newer players - best new player finish, etc. So use it to get your friends who are on the fence into the game! I'll probably have a preliminary tournament and introductory session sometime in late March or early April to give people a chance to get some practice in, and we'll be having regular Sunday play in the store. Yes, major thanks to Niko for arranging the hosting of the tournament. Without him it wouldn't be happening! I just thought people might be interested to know or view it as an additional draw. Not that I have a chance of winning, but I would love to attend. I am working that weekend but can probably get off. Just have to make a check of my finances. I have space, but it is limited. Maybe the best plan is to make a separate thread for looking/offering crash space for the event or something. That way people could also arrange hotel splits and so forth. Boston has quite decent public transit and the store is on the subway and several bus lines so an affordable hotel split should be pretty doable. I think I misread this....did that say no healer mages?!? Wtf!! Play the Monsters and Mercenaries faction and take all the Healer Mages you want! But seriously, Mercenaries are banned from this tournament for 3 reasons. 1) I really want to tournament to reflect the nice feature of Battleground that $30 gave you an army on footing with that of everyone else. Corollary: your WtF comment would be echoed by many new players the moment their opponent lays down an Ogre, Healer Mage, or Hydra! 2) The single most common flub that people make in Battleground is playing a faction-specific command card on a mercenary. Ban mercenaries and the problem goes away. 3) Fewer units to choose from means people are more likely to get their armies built within the time limit. 4) I don't know why the fascination with healermages and anyway I like to watch the veins in your forehead throb. Not quite. Any thoughts from the peanut gallery on whether the M&M is a viable faction? I like them a lot actually, their unique command cards are really pretty sweet. I'd never take them though because I know I'd be lured into using the Hill Giant far more often than would be good for me.